What do the medical organizations recommend regarding lactose maldigestion and intolerance? 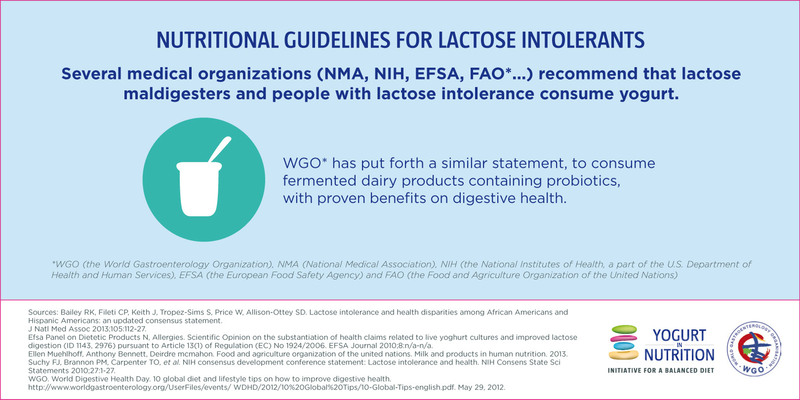 Several international and national medical organizations, including the European Food Safety Agency, the Food and Agriculture Organization of the United Nations and the US National Medical Association, recommend that lactose maldigesters and intolerants should not avoid dairy foods in order to prevent nutrients shortcomings. Instead, lactose maldigesters and intolerants should adapt their diet. Lactose maldigesters and intolerants can still consume lactose, in modest amounts, up to 12 g in one intake or up to 24 g, preferably in small amounts across the day, during meal, without experiencing symptoms. Several organizations also recommend the consumption of yogurt containing, at least, 108 live bacteria Lactobacillus delbrueckii subsp. bulgaricus and Streptococcus thermophilus, which improve lactose digestion and prevent symptoms in lactose intolerants. The World Gastroenterology Organisation has put forth a similar statement, to consume fermented dairy products containing probiotics, with proven benefits on digestive health, which is a tip from their 10 global diet and lifestyle tips on how to improve digestive health. Bailey et al. J Natl Med Assoc 2013;105:112-27. Black et al. Am J Clin Nutr 2002;76:675-80. Commission CA. Codex standard for fermented milks. Food and Agriculture Organization United Nation Roma 2003:1-5. Efsa Panel on Dietetic Products N, Allergies. Scientific Opinion on the substantiation of health claims related to calcium and maintenance of normal bone and teeth (ID 2731, 3155, 4311, 4312, 4703), maintenance of normal hair and nails (ID 399, 3155), maintenance of normal blood LDL-cholesterol concentrations (ID 349, 1893), maintenance of normal blood HDL-cholesterol concentrations (ID 349, 1893), reduction in the severity of symptoms related to the premenstrual syndrome (ID 348, 1892), “cell membrane permeability” (ID 363), reduction of tiredness and fatigue (ID 232), contribution to normal psychological functions (ID 233), contribution to the maintenance or achievement of a normal body weight (ID 228, 229) and regulation of normal cell division and differentiation (ID 237) pursuant to Article 13(1) of Regulation (EC) No 1924/2006. EFSA Journal 2010;8:n/a-n/a. Efsa Panel on Dietetic Products N, Allergies. Scientific Opinion on the substantiation of health claims related to live yoghurt cultures and improved lactose digestion (ID 1143, 2976) pursuant to Article 13(1) of Regulation (EC) No 1924/2006. EFSA Journal 2010;8:n/a-n/a. Heaney et al. J Am Coll Nutr 2000;19:83S-99S. Heaney et al. J Am Coll Nutr 2009;28 Suppl 1:82S-90S. Nicklas et al. Am J Clin Nutr 2011;94:191-8. Suchy et al. NIH Consens State Sci Statements 2010;27:1-27. So you think you’re lactose intolerant? Check with your doctor first! How to be sure that one is lactose intolerant? Lactose intolerance: what risks, what impacts and what solution? What is the lactose maldigestion? Can lactose intolerance be self-diagnosed? Lactose digestion from yogurt due to lactase?